Easy Blender Cilantro Lime White Bean Hummus. 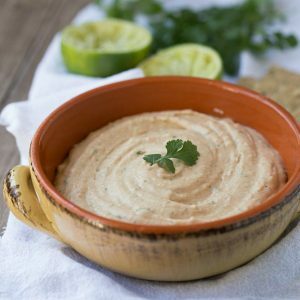 This easy hummus recipe is made with white beans, fresh cilantro and lime juice, chipotle peppers, tahini paste and garlic. Ingredients are blended in a blender or food processor. Vegan friendly. I’m a girl who likes to snack on hummus. 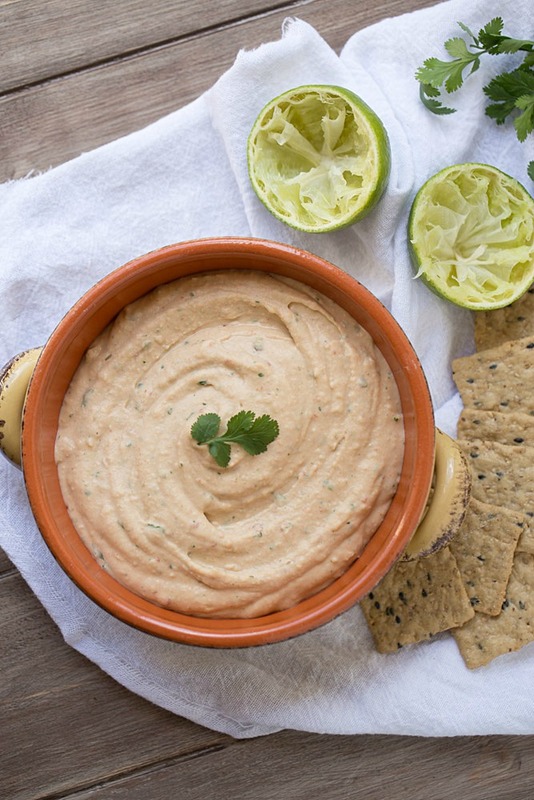 Smooth, creamy bean dip flavored with fresh ingredients like cilantro and limes is always sure to satisfy my 3pm snack cravings. 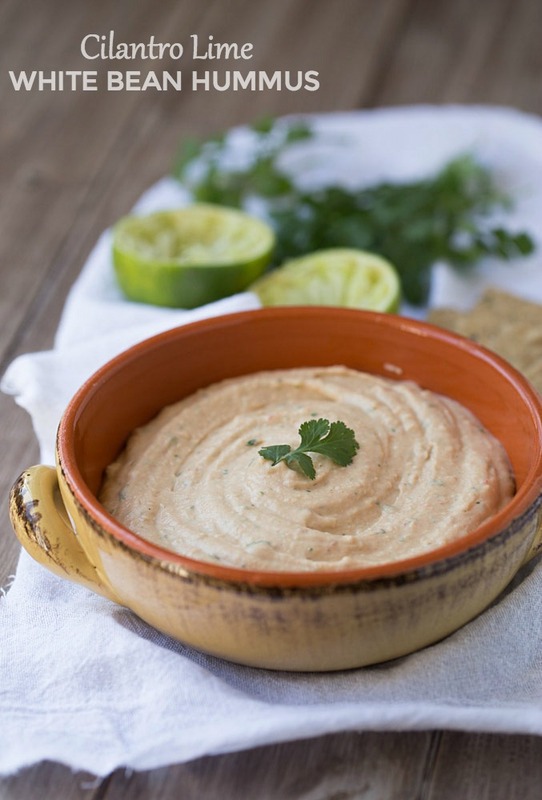 Easy blender cilantro lime white bean hummus is easy to make at home. No chopping veggies. Minimal cleanup. If you’re like me and you don’t own a large food processor, your blender will save the day! You may think of chickpeas when you think of hummus. But I’m going to change your thought process on that. I made my hummus with white beans. Using white beans results in a smoother, milder hummus. It’s perfect for those who don’t like chickpeas. Ken doesn’t like chickpeas. One time he said “I do not like those things” after I showed him a can of chickpeas. But he liked my cilantro lime white bean hummus. I like my hummus packed with fresh flavors. Cilantro, lime and chipotle are a few of my most favorite flavors to use in salsa and marinades. Since I love those flavors so much, I decided to make a white bean hummus with them. I packed this hummus full of cilantro, lime juice, garlic and chipotle pepper in adobo sauce. The chipotle pepper lends a tiny bit of heat, for those who love a little kick of heat in their dips. If you’re not a fan of heat, you can omit it. I used gluten free rice and almond crackers for dipping. 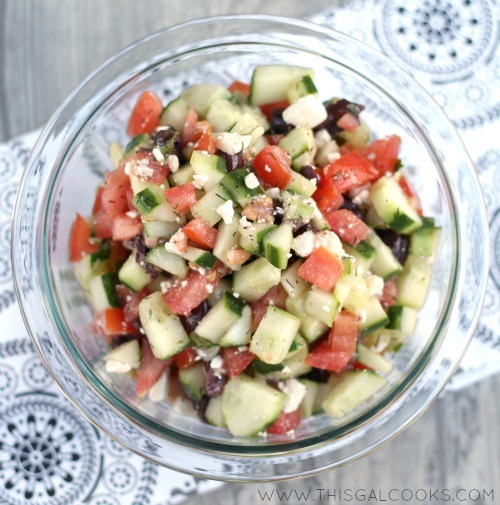 But you can use your favorite chip, cracker or veggie for dipping. Or you can eat it straight from the bowl with a spoon. 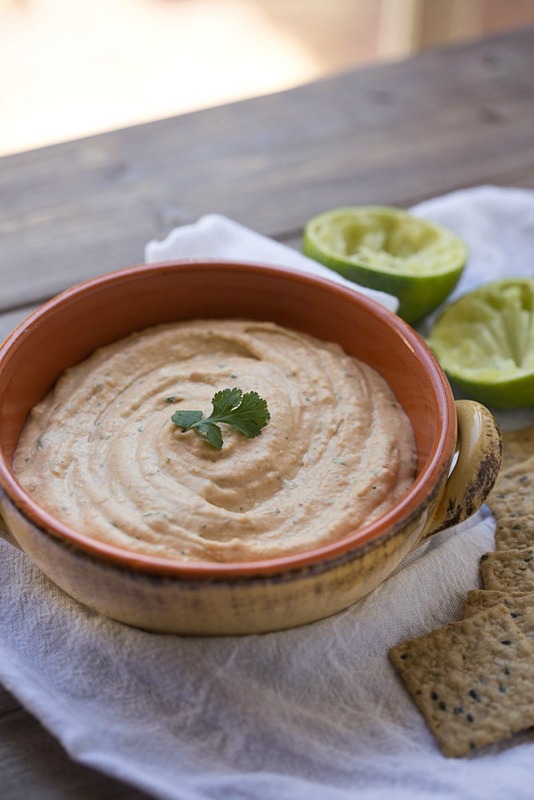 Smooth and creamy white bean hummus is packed with the fresh flavors of lime, cilantro and chipotle pepper. This hummus is perfect for those who don't like chickpeas. The flavor is mellow and the texture is smooth and creamy. Made in one blender or large food processor. No chopping veggies. Place all ingredients into your blender or a large food processor. Pulsate a couple of times and then blend on medium speed until smooth. Store covered in a refrigerator for up to 1 week. I’m such a hummus addict so I’m loving this, Julie! I actually just bought a white bean hummus this weekend, but your homemade version looks so much better! I love the addition of cilantro, too! Cilantro is my favorite herb, right up there with basil! Thanks so much for your sweet comment, Gayle! Julie, this hummus is right up my alley! I love the addition of the cilantro, reminds me of guac, which I love too! I am also a girl who likes to snack on hummus ;) I sometimes buy the tuscan white bean kind, and it’s one of my favorites! But this version sounds even better! I’ve never seen the Tuscan white bean hummus but I bet it’s good! What an awesome idea to use white beans and cilantro & lime – my fave! We do like chick peas a lot but this is a great new way to do hummus. Yum. And we use our blender ALL the time for stuff like this. Love. Pinning!! I’m very much a traditionalist about hummus, having learned to make it from a Lebanese boyfriend many years ago. However, this one sounds well worth making, too. It’s definitely worth a try, Susan! Super in love with this and really wishing i had some in front of me to try. Guess i just have to make my own. I love that you can just throw it in a blender and its no fuss! I love to snack wit Hummus too. And this looks delish and boy it sure is easy!!!! If I could put a tex mex spin on every single food on the face of the planet, I would. So clearly, I love this! I totally would, too! I love Tex Mex anything! We adore hummus and can go through a batch way too quickly. I love this white bean, lime, chipotle pepper and cilantro combo! It looks and sounds fabulous! I could totally eat it right from the bowl! No crackers needed, indeed! I am adoring this version of hummus, Julie! I have never made a hummus with anything other than chickpeas ( I know I’m so out of the loop ). Definitely trying this! Pinned! Thanks Justine! Hope you enjoy it as much as I did! Oh, my goodness … these photos are really making me want some of this hummus … now! I am such a ‘naughty’ snacker, mostly because I don’t have healthy enough snacks in the house. I really should make a big batch of hummus! Love this version with the mild beans and zingy lime and chipotle! 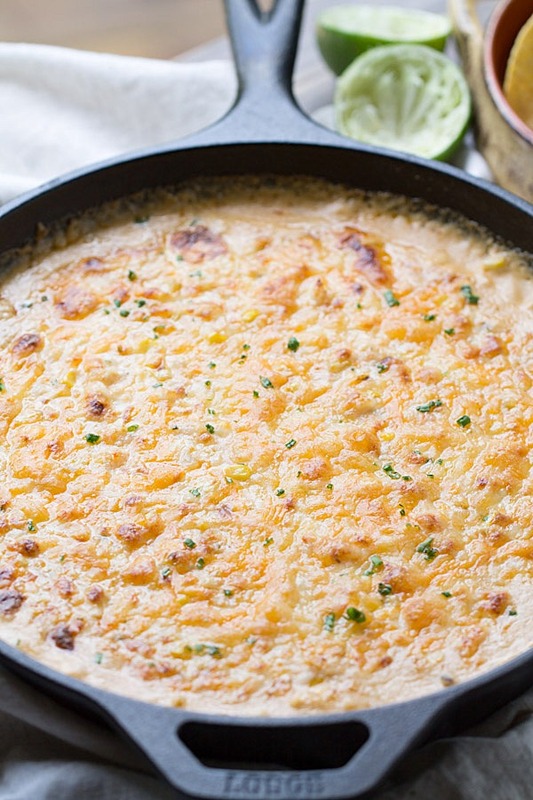 A nutritious dip packed with flavors? Ready in 10 minutes? And you said I don’t have to chop any vegetables?! Where do I sign. Pinned! Yeah! No vegetable chopping is what I dream about whenever I make anything. It doesn’t happen often but I’m so glad I can make this hummus so easily and without having to worry about chopping veggies! Thanks so much for stopping by and for the pin too, Meggan! I would seriously inhale this. It sounds SO GOOD!